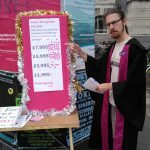 After the two national strike days on 23rd/24th May, UCU at each university were asked to choose one further day for a local strike, and most have gone for Open Days. 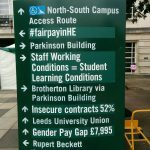 This means that prospective students and their parents are hearing about the campaign for fair pay in Higher Education quite a lot! Our strike at Leeds went very well. There were pickets around the university as staff arrived for work, and then a large and friendly presence throughout the morning greeting Open Day visitors and handing out ‘Please support our strike‘ leaflets (and giving directions..) Parents and prospective students were mostly very supportive. 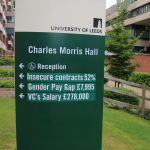 We ran the ‘guess the gender pay gap’ game again, and visitors were genuinely shocked that it’s so high at Leeds (£7,995 gap between the average pay of male and female academics, from HESA statistics). 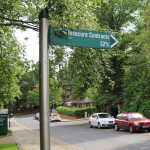 The statistic of 52% of academic staff here on insecure contracts also surprised visitors. 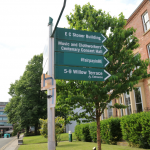 The signage around the University mysteriously changed overnight, see the photo gallery below (click on any photo to see it larger) and this generated quite a buzz on social media! 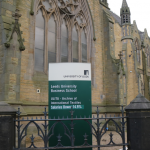 Leeds featured heavily in the Storify on the UCU ‘summer of protest‘. 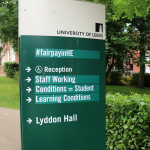 The campaign for Fair Pay in Higher Education will continue until universities’ managements offer a reasonable deal for our members on the three key pay-related areas: a fair pay rise, action on gender equality, and action on casualisation. Follow Leeds UCU on Twitter (@leedsucu) for up to date news, and members please check that emails from Leeds UCU aren’t disappearing into your Clutter folder! Are you on a casualised contract? Do you know someone who is? These include fixed term, hourly paid, zero hours, agency contracts… If you do not have a permanent, salaried post, then you are on a casualised contract. We know that casualised staff may have particular questions about taking part in industrial action. Did you know that casualisation issues are a key part of the current dispute? 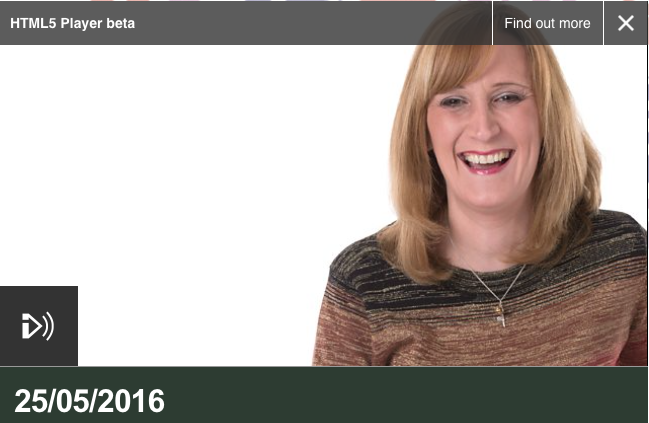 Do you want to find out more about the upcoming industrial action and campaigning? – How do I strike? – Why should I strike? – What about the “work to contract” action short of a strike (begins 25 May)? 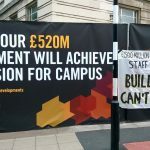 – What are we doing at Leeds to fight for secure and fair contracts and how are we including it in our campaigns? Please come to our UCU meeting for staff on casualised contracts on Monday at 4pm in Baines 1.13, and pass this message on to anyone (member or non-member) who is on a casualised contract. We will have tea, cake, and lots of solidarity and support! As the cuts bite across the public sector, it’s never been more important to build our union. You can help us grow today by emailing your colleagues and asking them to join. Staff in our colleges and universities have never needed their union more. We are a growing union, a campaigning union and a successful union. Every year, around 7,000 members seek help for a problem at work from their local UCU branch. We manage to resolve most of these issues but where we cannot the union’s legal service is there to gain redress. In the past 12 months that redress has amounted to more than £2m in settlements for members treated unfairly at work. We are campaigning hard to defend pensions, jobs and to hold back the privatisation of our education system. The more members we have, the stronger and more successful UCU will be.